The most dangerous road trip in history continues in the wacky third book of Dan Gutman's New York Times bestselling The Genius Files series, following twins Coke and Pepsi McDonald as they dodge nefarious villains all the way to Graceland. 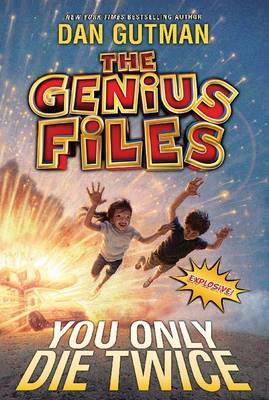 With the real-kid humor that has earned him millions of readers around the world, and featuring all new weird-but-true locations around America, this third book in the New York Times bestselling Genius Files series is one wild ride! The genius twins Coke and Pepsi have narrowly escaped a vat of a Spam, a pit of boiling fry oil, and a score of crazed adults all bent on killing them. But just when they thought they were safe, their arch nemesis Dr. Herman Warsaw reappeared, engaged to their Aunt Judy! Whoa-didn't he die already?! Now, as the twins continue their family road trip from Washington D.C. through the South, it will take every bit of their genius abilities to outwit their wacky enemies. It doesn't help that their parents remain totally oblivious! When they finally get to Graceland, Elvis's home in Memphis, Tennessee, Coke and Pepsi come to an explosive conclusion you'll have to read to believe!